This building is my own design, made for the communication of my solo show in Seoul ( April 2018 ), this building represent the balance I found myself in while living in South Korea. 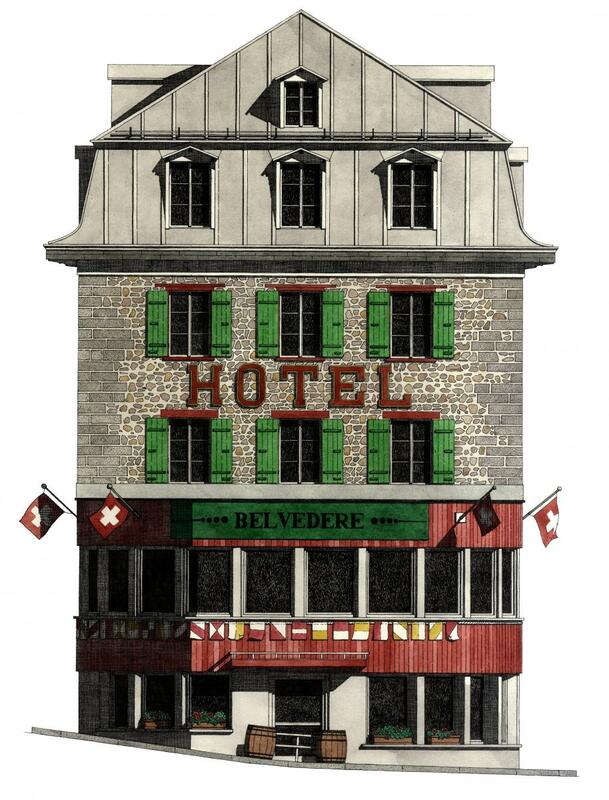 Thibaud Herem's rendering of the external facade of the building is an accurate and incredibly detailed illustration of a beautifully designed building. 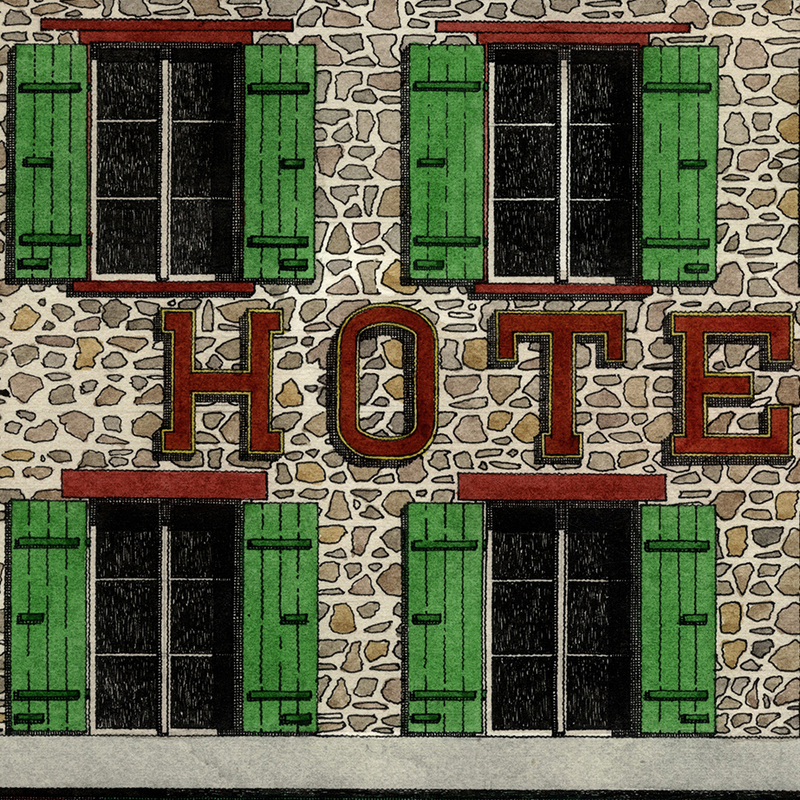 We've used the drawing across all the collateral, applying many of the architectural details such as ornamental borders and balustrades as counterpoints to the graphic design of the hotel's identity. The rich history of the building and the area are peppered across the material with quotes from local identities of note including Samual Pepys and Geoffrey Chaucer. one more of my favorite tree. First drawing of many about the Miami Art deco huge diversity of buildings, 12 x 16 cm. Private commission for a beautiful family and their house in London. 76 Dean street , London, is a mid-Georgian townhouse built in 1742 by T. Richmond. Absolutely stunning it has been rebuilt after a fire in 2009 and it is occupied by the famous Soho House. This beautiful building is an hotel located in the swiss alps. First a luxurious holiday place to stay, it is now close due to the proximity of the glacier. Private commission for a family house in London. 2016. To celebrate the New Year of the Rooster. Presentation of the different Soho House buildings around the world for the publication of the "Morning Noon Night" book, 2016. Illustration on postcards and posters for the Art on Postcards Charity. I created this image for the Japan based fashion brand, Sretsis Inn. Based in Tokyo, Aoyama, this was one perfect building for me to draw. I drew this tree for the production of a print book for Herman Miller. Selection of sketches and drawings made during my winter trip to Japan. A simple reminder to draw more and observe everything. La Carpe ( or Villa de la Carpe) is the 4th of a 4 drawings set presented at the Tokyo solo show in 2016 at the gallery Le Monde. These are the first fictional architectural drawings I present and this one is representing Winter. La Tortue ( or Villa de la Tortue) is the third of a 4 drawings set presented at the Tokyo solo show in 2016 at the gallery Le Monde. These are the first fictional architectural drawings I present and this one is representing Spring. La Chauve-Souris ( or Villa de la Chauve-Souris) is the second of a 4 drawings set presented at the Tokyo solo show in 2016 at the gallery Le Monde. These are the first fictional architectural drawings I present and this one is representing Autumn. Le Lézard ( or Villa du Lézard) is the first piece of a 4 drawings set presented at the Tokyo solo show in 2016 at the gallery Le Monde. These are the first fictional architectural drawings I present and this one is representing summer. Architecturally, ecologically and geographically Seasons is the theme of the moment. I produced 2 set of drawings for my very first solo show. I will show my original drawings at Le Monde Gallery in Harajaku, Tokyo, Japan. Original drawing 85 x 45 cm, ink. Opened in 1852, the station's design is magnificent in its simplicity, being based on two great arched train sheds, with a brick structure at the south end designed to reflect the main arches behind. Website illustration and printed material for the new communication of the South Kensington Club in London, UK. Original drawing 70 x 35 cm, ink and watercolour. Built in 1940, This shrine is dedicated to the spirit of Admiral Heihachiro Togo, celebrated as a shinto kami. The Togo Shrine was destroyed during WWII bombings and re-built in a more modern fashion in the 1960s. Prints are available on the shop. Original drawing 90 x 95 cm, ink and watercolour. Inspired by the set of the Wes Anderson movie released in 2014. The architecture is a mix of existing buildings, mostly inspired on the very pink Palace Bristol Hotel in Karlovy Vary (Carlsbad) in Czech Republic. This aristocratic manor dating back from the 19th century gave me the chance to do my first colour piece. Deco London takes you on a journey through the streets of London to discover the capital's most intriguing, striking and elaborate art deco buildings. This 3 metre-long frieze details 11 of London's most iconic art deco buildings including: The Hoover Factory, BBC Broadcasting House and Battersea Power Station. Logo for the Production Company Wild Aster. Wallpaper for the new extension of the Science Museum in London. The information Age, opened in 2014, the History of the Telephone corner. Really hard to take pictures so I invite you to visit it, Her Majesty the Queen was really impressed. Architecture drawing works as well in very small. Original drawing 70 x 125 cm, ink. Drawing for the 150 th anniversary of the London tube, drawing representing all the major iconic buildings of London, 2014. Built in 1974 by the architect Kazumasa Yamashita on a dreary street in downtown Kyoto. Original drawing 30 x 60 cm, ink. Drawing for the refurbishment of the Number 1 Palace Street in London, UK. Design of the Cover for the German Magazine SHOP. Issue released in 2014 about Paris. Original drawing 25 x 60 cm, ink. Drawing of the old Bromley Town Hall for a publication. Original drawing 60 x 85 cm, ink. 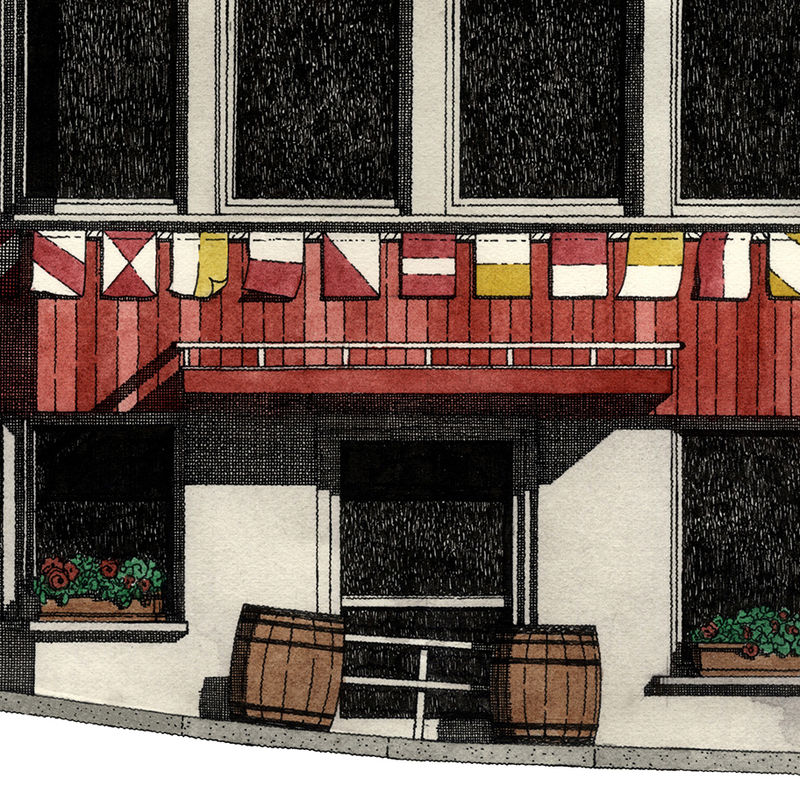 Drawing of The Line Hotel for the reopening of this historical modern building in Koreatown. Issue released in 2013 about Nuremberg. The Chateau de Fontainebleau is inspired by a Renaissance model, architect Jean Androuet, was built during the reign of Louis XIII (1610-1643). This drawing was made for the luxurious packaging of the famous french chocolate maker Frederic Cassel. Design of the invitation for the Anya Hindmarch event : Cabman shelters. It is located at 2 East 55th Street between Madison and Fifth Avenues. The 18-story French Beaux-Arts style hotel, the tallest in the city when built, was designed by architects Trowbridge & Livingston in 1904. Original drawing 20 x 45 cm, ink. Drawing of the Bespoke store of Anya Hindmarch in London Pont St, for the Hong Kong show in 2013. 5 illustrations of the work of the Architect Isay Weinfeld for the magazine Beyond. Original drawing 40 x 40 cm, ink. Marble Arch is a 19th-century white marble faced triumphal arch which was designed by John Nash in 1827. Architecture directory for the issue July 2013. With a special collaborator's page on my work. Original drawing 60 x 25 cm, ink. Founded in 1723 as a coffee house, became Georges Hotel in 1830 and then a public house as it is today. Current building is late Victorian. Original drawing 50 x 40 cm, ink. Column 70 x 10 cm, ink. For the reopening of the famous parisian Fashion house, Schiaparelli asked me to create 2 images for their new branding. The column and the building of the brand are located in Paris, place Vendome. The Villa Les Rhumbs was Christian Dior's childhood home, the Belle-Epoque style house dates from the late nineteenth century, Villa Les Rhumbs was built by shipowner Beust. "Rhumb" is an old marine term designating a wind rose divided into 32 rhumbs. Original drawing 65 x 15 cm, ink. The Clock Tower of the iconic St Pancras Station, opened in 1868 well known for the Victorian Architecture. The drawing of the whole building is in progress, the biggest of my collection. Original drawing 65 x75 cm, ink. This amazing art deco swimming pool was built in 1925 in Rennes (rue Gambetta) by the hometown architect Emmanuel Le Ray. Original drawing 20 x 24 cm, ink. Drawing of the Ground Zero memorial in NYC for the Fashon brand magazine ACNE. Original drawing 23 x 30 cm, ink. Best Kebab in Town for the food magazine The Gourmand.